Michigan’s bowhunting season opened October 1, and Department of Natural Resources conservation officers are sharing tips for a safe bowhunting experience. Before you go out, inspect equipment, including your tree stand or other raised platform. If anything is worn, frayed, cracked or peeling, replace it or get it fixed. *If using a compound bow or crossbow, make sure the cables and pulleys are in good working order. When sharpening broadheads, be careful and take your time. Practice tree-stand safety. The DNR recommends using a full-body safety harness to get into and out of your tree stand. If using a raised platform, always use a haul line to raise and lower your gear. Keep arrows in the quiver until you are ready to use them. A common injury is to stab or injure yourself or a hunting companion while carrying arrows in your hand or nocked on your bow. When heading out to the woods, hunt with a friend or family member or make sure you tell someone reliable where you are going and what time to expect you back. This information is valuable in helping conservation officers or sheriff’s deputies to find you if you are lost. Also, think about carrying a cell phone, compass, flashlight and other small safety items in when in the woods. Obtain permission from landowners before hunting on their land or using their land to access public land. Never take a shot at a deer that is beyond the maximum effective range of your equipment and your shooting ability. If you are successful, field dress your deer and cool its meat immediately. Michigan’s unpredictable weather means October days are sometimes warm, and warm temperatures and can cause the meat to spoil quickly. For more information about Michigan’s conservation officers, go to www.michigan.gov/conservationofficers. 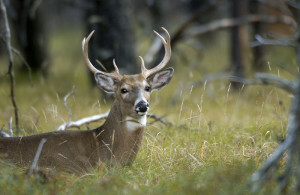 For more information about hunting in Michigan, go to www.michigan.gov/hunting.